Snowshoe cats are medium-sized cats that look like they are wearing a mask with darker markings on their ears, legs and tail. 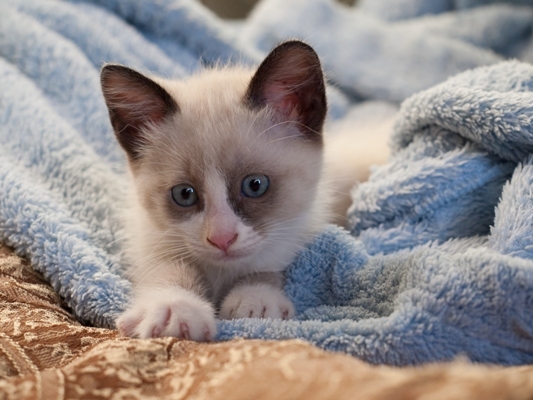 It is the striking blue eyes of the Snowshoe that really sets them apart from other felines. Their coat is short and usually a white/grey colour. Snowshoes are normally born all white and it’s not until they are about three weeks old that their colour and markings become visible and no two kittens have the same colouring. Just like the Siamese the Snowshoe comes in a variety colours including chocolate, blue, seal and lilac. The most popular colour for this breed are the blue and the seal. 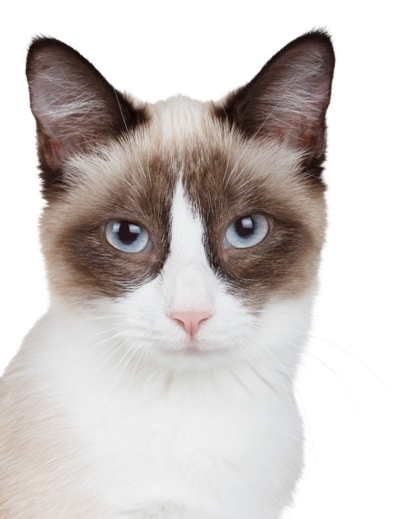 The Snowshoe cat is a Siamese and domestic short hair mix with a short, smooth coat. 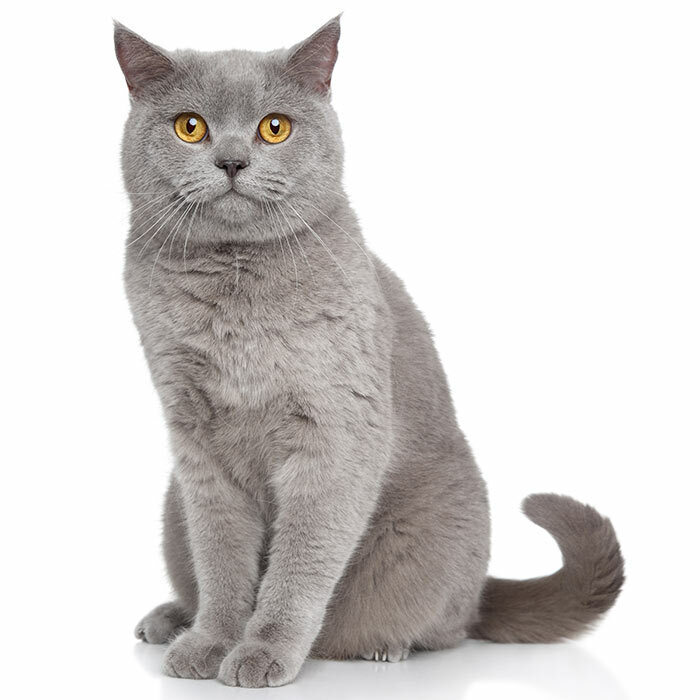 This cat sheds a moderate amount of hair and is a bi-colour cat with point colouring. The cat’s white socks feet are one of its most distinctive features and that’s where the cat got its name because their feet resemble snow shoes. The Showshoe cat has become popular recently thanks to Grumpy Cat the social media sensation because Grumpy cat has Snowshoe colourings. Snowshoes weigh between 2.5 and 5.5 kg with males large and more solid than the females. The average lifespan of the Snowshoe cat is 14 to 19 years. The Snowshoe Cat is a people’s cat and that means they love to be around children. They are likely to follow their owners around the house ‘talking’ to them. They don’t like to be left alone all day so if you already have other animals in the house it would be ideal, or two cats might be a good idea. These cats don’t mind the company of dogs and they can also be taught to fetch. They love to play games which makes them a great interactive pet. 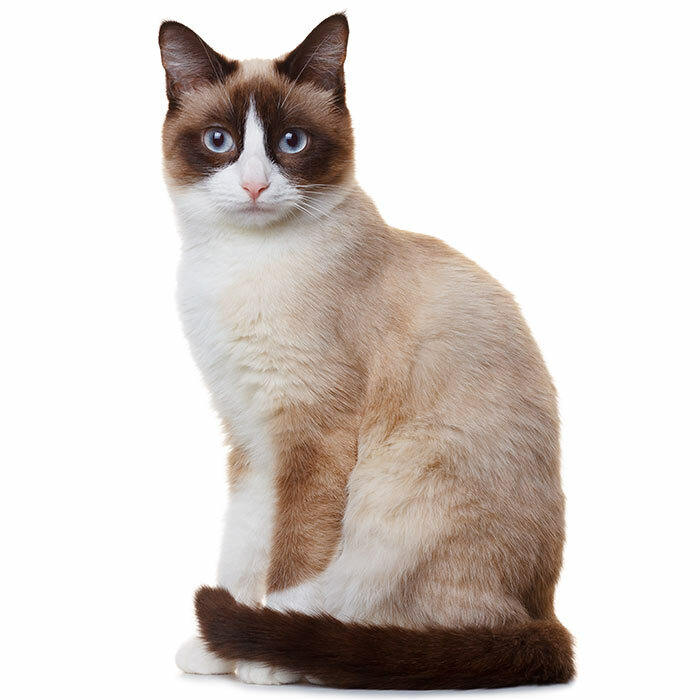 The Snowshoe is an active, engaging and affectionate cat that will easily fit in with family life. 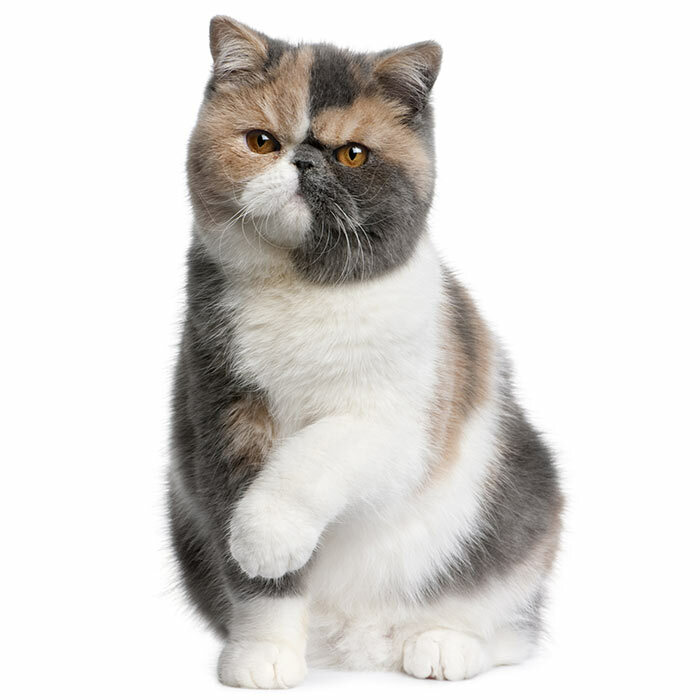 Feline lower urinary tract disease (FLUTD) is a disease that can affect the bladder and urethra of cats.  Cats with FLUTD present with pain and have difficulty urinating. They also urinate more often and blood may be visible in the urine. Cats may lick their genital area excessively and sometimes randomly urinate around the house. These symptoms may re-occur through a cat’s life so it’s best to discuss things with a vet. Vomiting. Cats vomit for a wide variety of reasons and most cast will vomit from time to time without much concern. Vomiting may be released to eating a bit too quickly or eating too much. Sudden or acute vomiting can be the result of a bacterial infection, gastric or intestinal foreign bodies, acute kidney or liver failure, pancreatitis or viral infection. If your cat is vomiting violently and regularly it’s best to have things check out as soon as possible. Feline Rhinotracheitis Virus Infection (Coryza). Feline viral rhinotracheitis (FVR) is an upper respiratory infection that is caused by feline herpesvirus 1 (FHV-1) that usually presents itself as coughing, sneezing and watery eyes Cats of all ages can suffer from this disease, but kittens are more susceptible to becoming infected. Just like the human herpes virus cats with this illness carry it with them all their lives and the disease may present itself when the cat is under stress. Progressive retinal atrophy. Progressive retinal atrophy refers to a family of eye conditions which cause the retina’s gradual deterioration. Night vision is lost in the early stages of the disease, and day vision is lost as the disease progresses. Many cats adapt to the loss of vision well, as long as their environment stays the same. The Snowshoe cat was developed in the United States as a breed in the late 1960’s by Dorothy Hinds-Daugherty, who was a Siamese cat breeder from Philadelphia. When three of Dorothy’s kittens were born with white feet she set about developing the breed. She also involved another breeder, Vikki Olander from Virginia. Together they set about developing the breed by mixing Siamese cats and American Shorthairs. In 1974 the Snowshoe Cat was accepted by the Cat Fanciers’ Foundation as an experimental breed.  The Snowshoe’s popularity did not take off straight away but over the years Vikki Olander was joined by other breeders who worked hard to continue to develop the distinctive markings of the breed.  In 1982 the Cat Fancier’s Foundation updated the status of the breed from experimental to provisions and in 1982 the Snowshoe cat accepted to be eligible for champion status by the Foundation. The first Snowshoe cat to be awarded the status of Grand Champion was BirmackLowansa of Nishna in 1990. 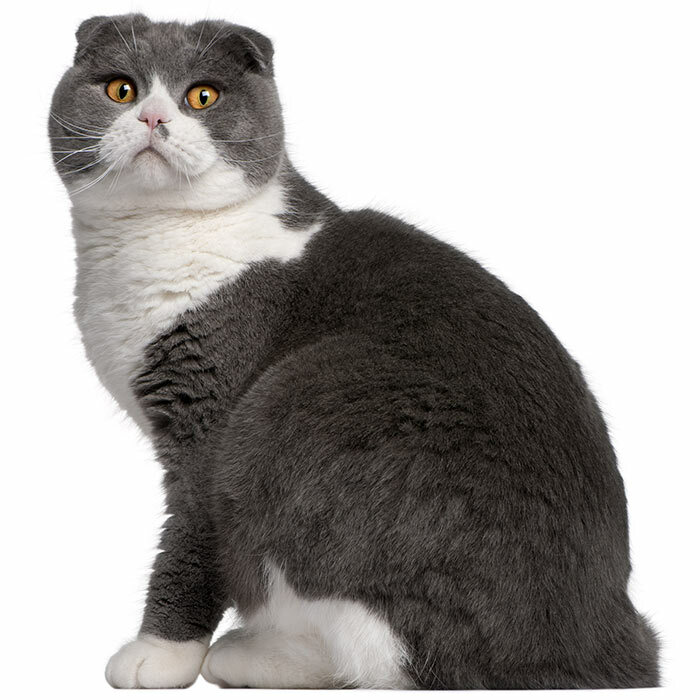 The Showshoe cat has developed to an extent that it is not usually crossed with American Shorthairs anymore. 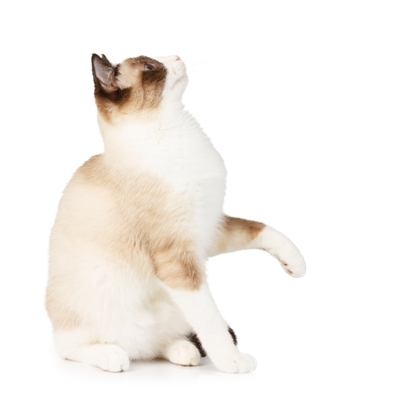 Snowshoe cats are very vocal and are one of the breeds of ‘talkative’ cats. They definitely like to let their owners know what’s on their mind. The official Grumpy Cat Facebook page has over 6 million ‘likes’. Grumpy Cat’s real name is Tardar Sauce. Snowshoes don’t really like to be left alone so if you are going to be away from the house for long periods the Snowshoe might not be the cat for you. 2 months free for kittens!